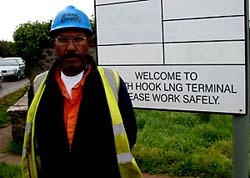 Workers at South Hook LNG (Liquified Natural Gas) have gone back to work following a 26-hour stoppage in support of a colleague who claims to have suffered from racial abuse on site. Three hundred men working for Shaw stopped working at 10 am on Thursday, and marched on the offices of main contractors Chicago Bridge and Iron. The men came out in support of fellow worker, Omar Mohamed, who alleges that he has suffered racial harassment from workers from another company sub contracting to CB&I. Mr Mohamed, a steel erector rigger from Cardiff, said that two workers had made Nazi salutes at him, spoken to him in a mock German accent and spun and pointed a hammer at him as if it was a gun. He claims that he went through the proper complaint channels for nine days, but when Shaw took the matter to CB&I, the matter was "swept under the carpet". "They never enforced their policy on racial harassment and never brought the abusers forward," said Mr Mohamed. The men called a meeting on Thursday and marched on the CB&I offices. They refused to work on Friday morning and crisis talks were held with union representatives. Mr Mohamed says that the police have now been called in to investigate the complaints and the alleged perpetrator has been suspended. It was only after this action had been agreed on that the men said they would return to work. "I was going to have to go off work because of the stress and frustration the bullying caused me," said Mr Mohammed. "I couldn't have done it without the support of the men. The management would have brushed it under the carpet until I gave up. They have only done something because the men came out. A spokesman for South Hook LNG said: "I can confirm that industrial action has been taken by a number of employees of one of the sub-contractors on the South Hook site. It is not our policy to comment on such matters via the media."